Ten Speed Press, 9781607745532, 672pp. A fully revised and expanded edition of the most comprehensive vegetarian cookbook ever published, from America’s leading authority on vegetarian cooking. What Julia Child is to French cooking, Deborah Madison is to vegetarian cooking—a demystifier and definitive guide to the subject. After her many years as a teacher and writer, she realized that there was no comprehensive primer for vegetarian cooking, no single book that taught vegetarians basic cooking techniques, how to combine ingredients, and how to present vegetarian dishes with style. Originally published in 1997, Deborah Madison’s Vegetarian Cooking for Everyone was both ahead of its time and an instant classic. It has endured as one of the world’s most popular vegetarian cookbooks, winning both a James Beard Foundation award and the IACP Julia Child Cookbook of the Year Award. Now, The New Vegetarian Cooking for Everyone picks up where that culinary legacy left off, with more than 1,600 classic and exquisitely simple recipes for home cooks, including a new introduction, more than 200 new recipes, and comprehensive, updated information on vegetarian and vegan ingredients. 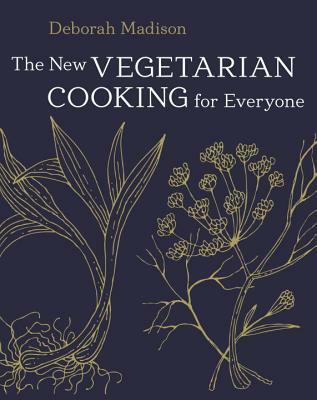 A treasure from a truly exceptional culinary voice, The New Vegetarian Cooking for Everyone is not just for vegetarians and vegans—it’s for everyone interested in learning how to cook vegetables creatively, healthfully, and passionately. "How do you improve on a classic? Update the recipes, add a bunch of new ones, and add a slick new cover design that will have even the diehard fans of the original happily in the kitchen. Oh, and meat eaters: don't sleep on Madison just because the word "vegetarian" is in the title. You might learn something."